It’s soccer season for many of our kids and this takes a lot of family commitment. Every weekend belongs partially to soccer and for some families there are weekday practices as well. During my many hours on the field, I’ve been noticing and appreciating the fathers who volunteer their time and effort by coaching the kids. This takes a lot of work. I know because my husband coached last season. This year he couldn’t due to a knee injury but many of the dads do this each year and often for other sports as well. This requires dedication. 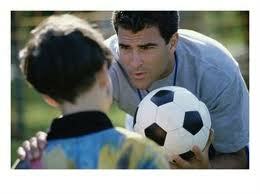 They need to look up games to make the practices more engaging for the younger children. For the older kids they need to be well versed in all the rules and think of strategies based on the skills of the players. Many of these men have not played soccer themselves in many years so it takes work to coach. They sometimes need to go to training sessions as well. Not to mention that they can’t miss a single game. People always make comments about soccer moms since we are often driving our kids to all their activities but we rarely hear soccer dads mentioned. Without these dads who dedicate their time to helping our kids improve their skills, we may not have a lot of these community sports programs. We all know that the economy at this time doesn’t give us the luxury of hiring extra people so we really value these volunteers. I’m glad to see that this is no longer a time of parenting from the sidelines and expecting kids to succeed solely based on people we pay like teachers and coaches. Of course we do need professionals to teach them the things we cannot but without parental engagement, their chances for success are lower. Children who have parents that take a full interest in their lives and activities are sure to be happier and more confident as well. I say ‘Thank you’ to all the parents who take time out to help their own kids and ours! This entry was posted in Opinion, Parenting, Sports and tagged Association football, Children, Coach, Dads, parents, Soccer, Sport, Volunteer coach. Bookmark the permalink.